Organizations servicing portable equipment need simplified battery testing. The difficulty of testing batteries is brought on by the proliferation of batteries, both in volume and diversity of models. With most standalone battery test equipment, servicing batteries with conventional methods is complex and time consuming. This task will only get more difficult as new battery models are added, almost weekly. New chemistries are being introduced which have different service requirements. Manufacturers of battery test equipment are responding by introducing software packages that run on a PC. Many new systems enable operating the battery analyzers through a PC. Such products bring battery maintenance within reach of the untrained operator. Cadex Batteryshop™ is a system that integrates with the Cadex 7000 Series battery analyzers. 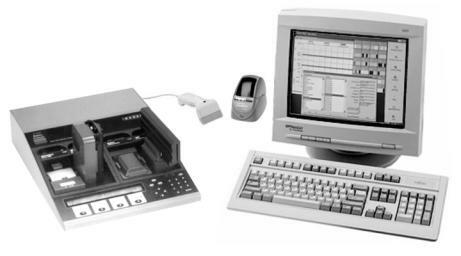 Although the analyzers are stand-alone units that can think on their own, the software overrides the analyzer to adjust the settings, and stores the test results obtained from the batteries. Figure 12-2 illustrates such a battery maintenance system. Figure 12-2: Components of a battery maintenance system. Cadex Batteryshop™ stores the battery test results on the database. Point and click technology programs the analyzer by selecting the battery from a listing of over 2000 commercial batteries. The system accommodates up to 120 analyzers for simultaneous service of 480 batteries. Here are examples of how a computer-assisted battery testing system can simplify operation. To service a battery with Cadex Batteryshop™, for example, the user selects the battery model from the database, clicks the mouse, and the analyzer is automatically configured to the correct battery parameters. Programming the analyzer by scanning the bar code identifying the battery’s model number is also possible. In the near future, the operator will be able to view a picture of the battery on a PC monitor. Clicking on the image will reveal the various models available in that battery family. Clicking on the correct model will program the analyzer. Each battery is marked with a permanent bar code label containing a unique battery ID number. When servicing the battery, the user scans the battery ID and the analyzer is automatically configured through the PC. All battery test results are stored and updated in the database under the assigned battery ID number. Any reference to this battery in terms of performance, maintenance history and even vendor information is available with a click of a mouse. Delivering batteries with consistent high quality is a concern for all battery manufacturers and distributors. With advanced battery maintenance systems, battery batches can be tested and documented to satisfy quality control standards. Voltage, current and temperature information can be displayed in real-time graphics. Cadex Batteryshop™, includes specialty programs that may not be available on other software products. For example, the program allows discharging a battery under a given pulsed current to simulate digital load requirements. Other programs include life cycling to evaluate the battery’s longevity, self-discharge tests, quick formatting and priming. The Internet allows updating the battery database to include new entries, fetching battery matrix settings for quick testing, sending battery test results to a central location, and downloading of new firmware for the Cadex 7000 Series battery analyzers.